Forty-seven students from Seneca Grade School participated in the Solo and Ensemble Contest held on Saturday, March 16, at Milton Pope Grade School. A total of 43 First Division ratings and 5 Second Division ratings were earned by the students. Of these totals, 31 instrumental solos received First Division ratings and 4 received Second Division ratings. Five vocal solos received First Division ratings. Six instrumental ensembles received First Division ratings and one received Second Division ratings. One vocal ensemble received a First Division rating. The instrumental students are coached by Stephanie Kirk and the vocal students are coached by Michael Richards. A big thank you to George McComb and Jan Hinkleman who also accompanied instrumental students. 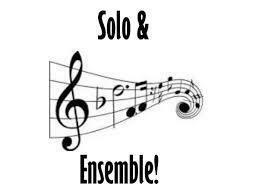 Division I Instrumental Solos - Alexis Crask, Clint Kerrigan, Caroline Paulson, Sean Rentauskas, Bruce Smolucha, Alexis Sprinkel, Brianna Brown, Samuel Churchill, Cassidy Fosen, Michelle Govea, Jolena Odum, Airianna Wierzbicki, Clara Bruno, Austin Buchanan, Layla Fessler, Justin Goslin, Aubrie Jackson, Tynan Justice, Casey Klicker, Kylie Kofoid, Lilly Lynch, Haylea Shear, Nate Sprinkel, Landrie Callahan, Abigail Churchill, Mary Kerrigan, Brianna Newkirk, Brandon Rentauskas, Brooklyn Szafranski, and Chloe Thompson. Division II Instrumental Solos – Mohammad Abushanab, Nina Hacker, Elizabeth Paulson, and Carter Progress. Division I Instrumental Ensembles – Alexis Crask & Elizabeth Reyes; Caroline Paulson & Noah Miller; Airianna Wierzbicki & Michelle Govea; Cassidy Fosen & Samuel Churchill; Aubrie Jackson, Ambrey Terry, Michele Cheshareck, Eryn Stilwell, Clara Bruno, Casey Klicker, Nate Sprinkel, Ashlin Jackson & Anna Bruno; Kyra Wood & Danica Loveland. Division I Vocal Solos –Ashlin Jackson, Eryn Stilwell, Caroline Paulson, Jolena Odum, and Vivian Chapman. Division I Vocal Ensembles – Taylor Nicolaides, Brooklyn Szafranski, Chloe Thompson & Kyra Wood.